Likely doubts over the adoption of OpenStack centre around the impact of infrastructure virtualisation. From the skeptical perspective of an HPC architect, why OpenStack? In this section, we will describe the different forms of overhead that can be introduced by virtualisation, and provide technical details of solutions that mitigate, eliminate or bypass the overheads of software-defined infrastructure. Analysis typically shows that the overhead of virtualisation for applications that are CPU or memory intensive is minimal. Similarly, applications that depend on high-bandwidth I/O or network communication for bulk data transfers can achieve levels of performance that are close to equivalent bare metal configurations. Where a significant performance impact is observed, it can often be ascribed to overcommitment of hardware resources or “noisy neighbours” - issues that could equally apply in non-virtualised configurations. However, there remains a substantial class of applications whose performance is significantly impacted by virtualisation. Some of the causes of that performance overhead are described here. Factors such as storage IOPs and network message latency are often critical for HPC application performance. HPC applications that are sensitive to these factors are poor performers in a conventional virtualised environment. Fully-virtualised environments incur additional overhead per I/O operation that can impact performance for applications that depend on such patterns of I/O. The additional overhead is mitigated through paravirtualisation, in which the guest OS includes support for running within a virtualised environment. The guest OS cooperates with the host OS to improve the overhead of hardware device management. Direct hardware device manipulation is performed in the host OS, keeping the micro-management of hardware closer to the physical device. The hypervisor then presents a more efficient software interface to a simpler driver in the guest OS. Performance improves through streamlining interactions between guest OS and the virtual hardware devices presented to it. All modern Ethernet NICs provide hardware offload of IP, TCP and other protocols. To varying degrees, these free up CPU cycles from the transformations necessary between data in user buffers and packets on the wire (and vice versa). In a virtualised environment, the network traffic of a guest VM passes from a virtualised network device into the software-defined network infrastructure running in the hypervisor. Packet processing is usually considerably more complex than a typical HPC configuration. Hardware offload capabilities are often unable to operate or are ineffective in this mode. As a result, networking performance in a virtualised environment can be less performant and more CPU-intensive than an equivalent bare metal environment. To varying degrees, virtualised environments generate increased system noise effects. These effects result in a longer tail on latency distribution for interrupts and I/O operations. A bulk synchronous parallel workload, iterating in lock-step, moves at the speed of the slowest worker. If the slowest worker is determined by jitter effects in I/O latency, overall application progress becomes affected by the increased system noise of a virtualised environment. There is considerable development activity in the area of virtualisation. New levels of performance and capability are continually being introduced at all levels: processor architecture, hypervisor, operating system and cloud orchestration. The twice-yearly cadence of OpenStack software releases leads to rapid development of new capabilities, which improve its performance and flexibility. Across the OpenStack operators community, there is a continual collaborative process of testing and improvement of hypervisor efficiency. Empirical studies of different configurations of tuning parameters are frequently published and reviewed. Clear improvements are collected into a curated guide on hypervisor performance tuning best practice. Enabling processor architecture extensions for virtualisation. 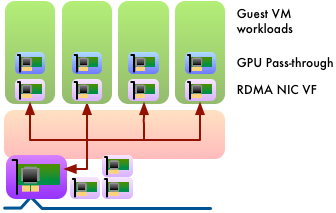 Controlling hypervisor techniques for efficiently managing many guests, such as Kernel Same-page Merging (KSM). This can add CPU overhead in return for varying degrees of improvement in memory usage by de-duplicating identical pages. For supporting memory-intensive workloads, KSM can be configured to prevent merging between NUMA nodes. For performance-critical HPC, it can be disabled altogether. Pinning virtual cores to physical cores. Passing through the NUMA topology of the physical host to the guest enables the guest to perform NUMA-aware memory allocation and task scheduling optimisations. Passing through the specific processor model of the physical CPUs can enable use of model-specific architectural extensions and runtime microarchitectural optimisations in high-performance scientific libraries. Backing guest memory with huge pages reduces the impact of host Translation Lookaside Buffer (TLB) misses. By using optimisation techniques such as these, the overhead of virtualisation for CPU-bound and memory-bound workloads is reduced to typically one–two percent of bare metal performance. More information can be found in Further Reading for this section, below. Conversely, by constraining the virtual architecture more narrowly, these tuning parameters make VM migration more difficult in a cloud infrastructure consisting of heterogeneous hypervisor hardware, in particular, this may preclude live-migration. Hardware devices that support Single-Rooted I/O Virtualization (SR-IOV) enable the hardware resources of the physical function of a device to be presented as many virtual functions. Each of these can be individually configured and passed through into a different VM. In this way, the hardware resources of a network card can provide performance with close to no additional overhead, simultaneously serving the diverse needs of many VMs. Through direct access to physical hardware, SR-IOV networking places some limitations on software-defined infrastructure. It is not typically possible to apply security group policies to a network interface mapped to an SR-IOV virtual function. This may raise security concerns for externally accessible networks, but should not prevent SR-IOV networking being used internally for high-performance communication between the processes of an OpenStack hosted parallel workload. Recent empirical studies have found that using SR-IOV for high-performance networking can reduce the overhead of virtualisation typically to 1-9% of bare metal performance for network-bound HPC workloads. Links to some examples can be found in the Further Reading section below. Some classes of HPC applications make intensive use of hardware acceleration in the form of GPUs, Xeon Phi, etc. Specialised compute hardware in the form of PCI devices can be included in software-defined infrastructure by pass-through. The device is mapped directly into the device tree of a guest VM, providing that VM with exclusive access to the device. A virtual machine that makes specific requirements for hardware accelerators can be scheduled to a hypervisor with the resources available, and the VM is ‘composed’ by passing through the hardware it needs from the environment of the host. The resource management model of GPU devices does not adapt to SR-IOV. A GPU device is passed-through to a guest VM in its entirety. A host system with multiple GPUs can pass-through different devices to different systems. Similarly, multiple GPU devices can be passed-through into a single instance and GPUdirect peer-to-peer data transfers can be performed between GPU devices and also with RDMA-capable NICs. Device pass-through, however, can have a performance impact on virtualised memory management. The IOMMU configuration required for pass-through restricts the use of transparent huge pages. Memory must, therefore, be pinned in a guest VM using pass-through devices. This can limit the flexibility of software-defined infrastructure to over-commit virtualised resources (although over-committed resources are generally unlikely to be worthwhile in an HPC use case). Static huge pages can still be used to provide a boost to virtual memory performance. The performance overhead of virtualised GPU-intensive scientific workloads has been found to be as little as 1% of bare metal performance. More information can be found in the Further Reading section below. Different strategies for efficient handling of hardware devices. Here a network card is used as example. In paravirtualisation a virtual network device is created in software that is designed for the most efficient software interface. In PCI-passthrough a physical device is transferred exclusively from the hypervisor to a guest VM. In SR-IOV, a physical device creates a number of virtual functions, sharing the physical resources. Virtual functions can be passed-through to a guest VM leaving the physical device behind in the hypervisor. The overheads of virtualisation are almost eliminated by moving to a different model of compute abstraction. Containers, popularised by Docker, package an application plus its dependencies as a lightweight self-contained execution environment instead of an entire virtual machine. The simplified execution model brings benefits in memory usage and I/O overhead. Currently, HPC networking using RDMA can be performed within containers, but with limitations. The OFED software stack lacks awareness of network namespaces and cgroups, which prevents per-container control and isolation of RDMA resources. However, containers configured with host networking can use RDMA. OpenStack’s software-defined infrastructure does not need to be virtual. Ironic is a virtualisation driver. Through some artful abstraction it presents bare metal compute nodes as though they were virtualised compute resources. Ironic’s design philosophy results in zero overhead to the performance of the compute node, whilst providing many of the benefits of software-defined infrastructure management. Through Ironic, a user gains bare metal performance from their compute hardware, but retains the flexibility to run any software image they choose. Complex image deployments (over multiple disks for example) is an evolving capability. Ironic bare metal instances cannot be dynamically intermingled with virtualised instances. However, they can be organised as separate cells or regions within the same OpenStack private cloud. Some standard virtualisation features could never be supported, such as overcommitment and migration. See the section OpenStack and HPC Infrastructure Management for further details about Ironic. 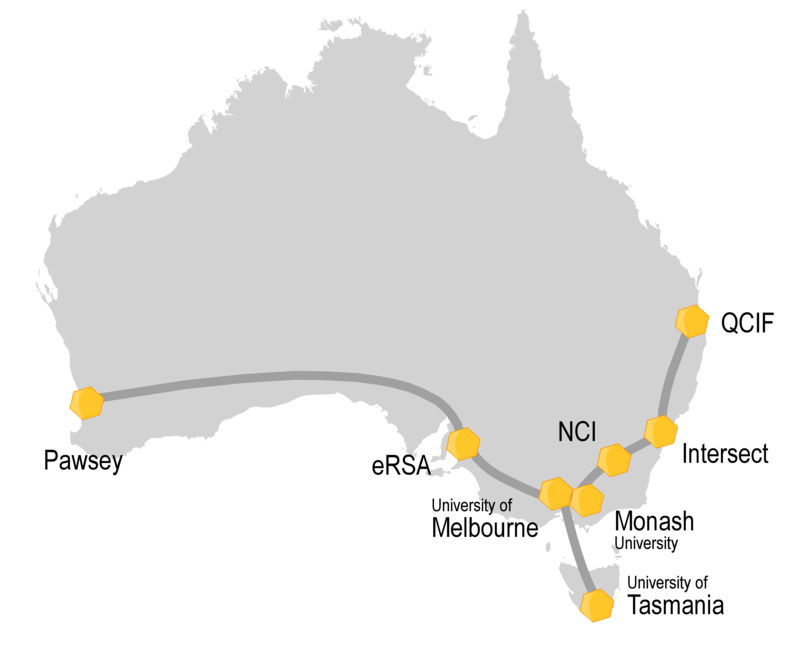 From its inception in 2012, Australian scientific research has benefited from the NeCTAR Research Cloud federation. Now comprising eight institutions from across the country, NeCTAR was an early adopter of OpenStack, and has been at the forefront of development of the project from that moment. NeCTAR’s federated cloud compute infrastructure supports a wide range of scientific research with diverse requirements. Monash Advanced Research Computing Hybrid (MonARCH) was commissioned in 2015/2016 to provide a flexible and dynamic HPC resource. MonARCH has 35 dual-socket Haswell-based compute nodes and 820 CPU cores. MonARCH exploits cloud-bursting techniques to grow elastically by using resources from across the NeCTAR federation. The infrastructure uses a fabric of 56G Mellanox Ethernet for a converged, high-speed network. The cloud control plane is running Ubuntu Trusty and the KVM hypervisor. OpenStack Liberty (as of Q3’2016) was deployed using Ubuntu distribution packages (including selected patches as maintained by NeCTAR Core Services), orchestrated and configured using Puppet. MonARCH makes extensive use of SR-IOV for accessing its HPC network fabric. The high-speed network is configured to use VLANs for virtual tenant networking, enabling layer-2 RoCEv1 (RDMA over Converged Ethernet). RDMA is used in guest instances in support of tightly coupled parallel MPI workloads, and for high-speed access to 300TB of Lustre storage. Following MonARCH, Monash University recently built a mixed CPU & GPU cluster called M3, the latest system for the MASSIVE (Multi-modal Australian ScienceS Imaging and Visualisation Environment) project. Within M3, there are 1700 Haswell CPU cores along with 16 quad-GPU compute nodes and an octo-GPU compute node, based upon the NVIDIA K80 dual-GPU. Staff at Monash University’s R@CMon cloud research group have integrated SR-IOV networking and GPU pass-through into their compute instances. Specific high-performance OpenStack flavors are defined to require pass-through of one or more dedicated GPUs. This enables one to four GPU instances to run concurrently on a dual-K80 compute node, e.g., to support CUDA accelerated HPC workloads and/or multiple interactive visualisation virtual-workstations. “Using OpenStack brings us a high degree of flexibility in the HPC environment. Applying cloud provisioning and management techniques also helps to make the HPC-stack more generic, manageable and quick to deploy. Plus, we benefit from the constant innovation from the OpenStack community, with the ability to pick and choose new services and projects from the ecosystem. OpenStack’s flexibility in the SDN space also offers compelling new avenues to integrate researchers’ personal or lab servers with the HPC service. When evaluating OpenStack as a candidate for HPC infrastructure for research computing, the “time to paper” metric of the scientists using the resource should be included in consideration. Skeptics of using cloud compute for HPC infrastructure inevitably cite the various overheads of virtualisation in the case against OpenStack. With a rapidly-developing technology, these arguments can often be outdated. Furthermore, cloud infrastructure presents a diminishing number of trade-offs in return for an increasing number of compelling new capabilities. Standardisation as users can interact with the system through a user-friendly web interface, a command line interface or a software API. Flexibility and agility as users allocate compute resources as required and have exclusive use of the virtual resources. There is fine-grained control of the extent to which physical resources are shared. Users can self-serve and boot a software image of their choosing without requiring operator assistance. It is even possible for users to create their own software images to run - a powerful advantage that eliminates toil for the administrators and delay for the users. Additional security as users have a higher degree of separation from each other. They cannot observe other users and are isolated from one another on the network. Through careful consideration, an HPC-aware configuration of OpenStack is capable of realising all the benefits of software-defined infrastructure whilst incurring minimal overhead. In its various forms, virtualisation strikes a balance between new capabilities and consequential overhead. Professor DK Panda and Dr. Xiaoyi Lu from NOWLAB, Ohio State University. Blair Bethwaite, Senior HPC Consultant at Monash University.